Griot's Garage One-Step Sealant will polish and protect with just one application! Removes ultra fine scratches, oxidation, and very fine swirl marks from your paint, all while leaving behind a durable layer of protection that lasts up to one year. You can apply this product by hand, or for optimal results we recommend applying via a dual action polisher and a White Polishing Pad. You will be amazed at how well the Griot's Garage One-Step Sealant removes light imperfections in your paint really making it stand out from the crowd. It will protect far longer than natural waxes, so you do not have to worry about harmful UV rays, moisture, oxidation, salt water, pollution, bug smear, and other everyday contaminates. It applies extremely easy and thin so you get a great value from just one bottle. With the Griot's Garage One-Step Sealant you will enjoy intense depth, clarity, and long term protection in one easy step! Thank you for selecting this quality Griot's product. One-Step Sealant provides all the benefits of long-term protection of our Paint Sealant with a gentle polish to remove scratches, oxidation, and swirl marks. Enjoy the best! Useful Directions: It is normal for this product to separate; shake well before and during use. Surface must be clean, cool, and dry before application. Do not apply in direct sunlight. Spread a small amount on an Orange Foam Polish Pad. Apply in a back and forth motion by hand or with our Random Orbitals. Let dry to a light haze. Buff off using a Micro Fiber Polish Removal Cloth. Store above freezing and avoid extreme heat. 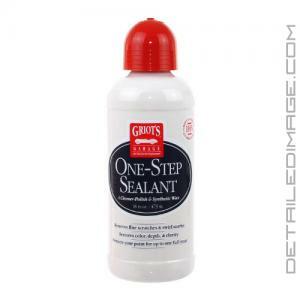 I've tried other 1 step products by other companies and I find myself going back to griots garage original 1 step sealent. Granted it's not a true paint correction cream but for a nice 1 step process it really does a nice job and great protection. This is one phenomenal product is all I can say! I applied with the old Porter Cable 7424 Random Orbital as the final step of a three stage process. Just as I thought the shine could not get any better as I removed it (with great ease I might add) I was shocked to see the shine and metallic that I had not seen on my 96 Explorer with the factory paint (now 22 years old) in many years! Best of it's kind on the market! Period! This product is a game changer! Pros- On and off with ease! Staying power, even after a hard rain nothing sticks! Does not stain molding. Cons- If there are any I have not found them!